Forefront Protection for Exchange – Still Number One! 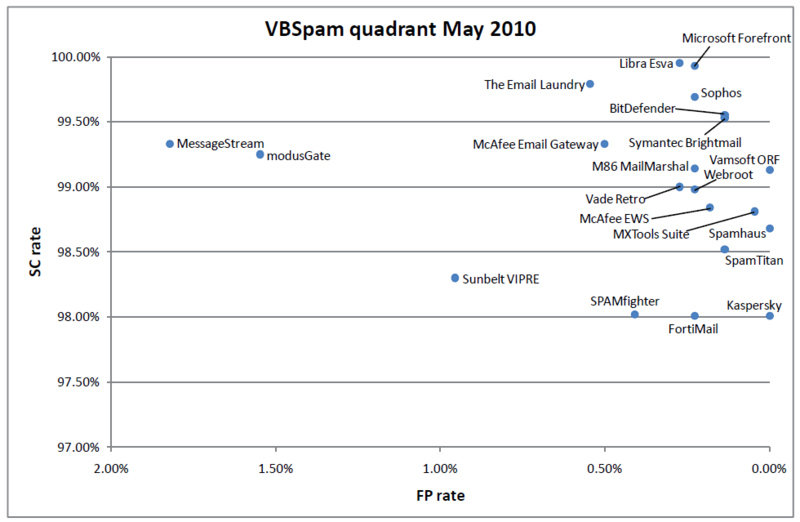 The July 2010 issue of the VirusBulletin issued today has another comparative report on anti-spam solutions. In the latest comparative report, Microsoft Forefront Protection for Exchange still leads the competition with the highest spam catch detection rate and the lowest (zero) false positives rate. This is the third consecutive time that Microsoft Forefront Protection for Exchange got the highest final score in the VBspam comparative report. In this report (and also in the previous reports), Microsoft Forefront Protection for Exchange has shown remarkably better capabilities compared to Symantec, McAfee, Kaspersky, and other competitive solutions. 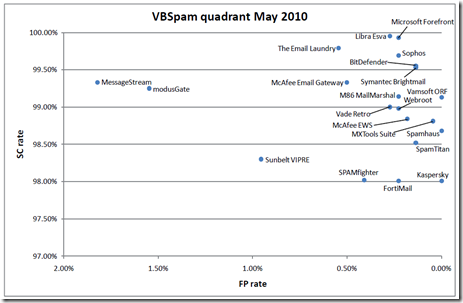 With the second best spam catch rate overall and just a handful of false positives on the last occasion, Microsoft’s Forefront Protection 2010 for Exchange Server seemed unlikely to improve on its past performance in this test. However, the product still managed to do that and a stunning spam catch rate of 99.96% combined with a total lack of false positives not only wins the product its sixth consecutive VBSpam award, but also gives it the highest final score for the third time in a row. VirusBulletin’s detailed comparative reports can be downloaded by subscribers from www.virusbtn.com. Do you already have Forefront Protection for Exchange? It’s likely you already own the licenses for this award-winning anti-spam solution and you’re not aware of it. If you have the Forefront Security Suite in your license agreement, you are already licensed to use Forefront Protection for Exchange. For more information, speak to your Microsoft account manager. 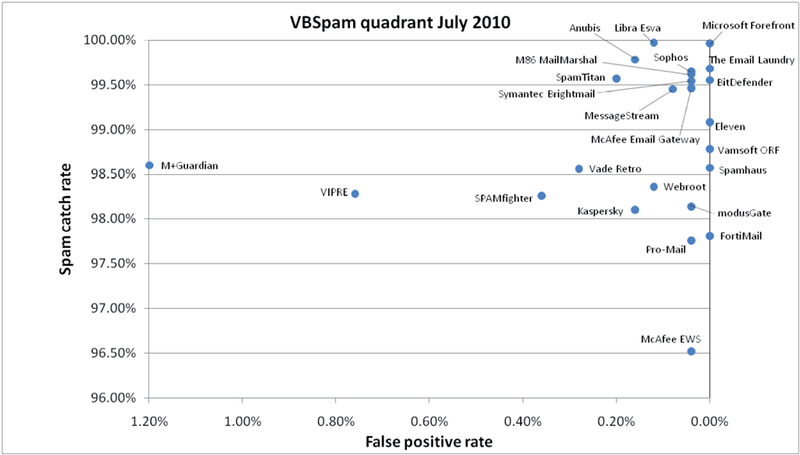 I am excited to write about the latest anti-spam comparative test results from VirusBulletin. 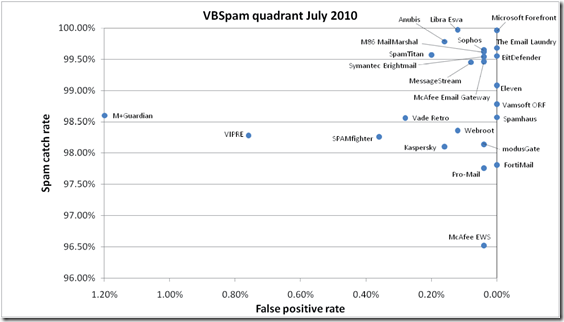 Forefront Protection for Exchange emerged as the winner in the May 2010 test results, with an extremely high spam catch (SC) rate and a very low false positive (FP) rate. 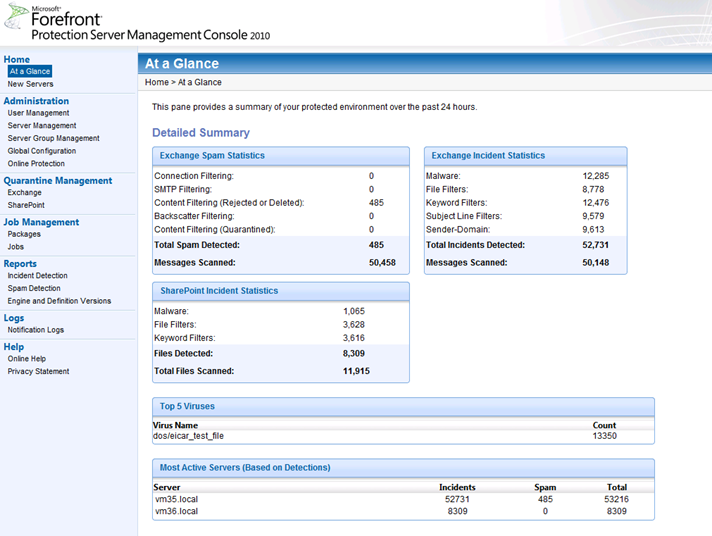 Microsoft’s Forefront Protection 2010 for Exchange Server was the clear winner of the last test, achieving the highest final score by some distance. The final scores of the various products were closer this month, but with the second highest spam catch rate and just a handful of false positives,Forefront was yet again the product with the highest final score and adds another VBSpam award to its collection. In this post, I am sharing the current position of Forefront Client Security (Forefront Endpoint Protection) and Forefront Protection for Exchange in the market, in comparison to similar solutions from other competitors. We have very high comparative ratings from VirusBulletin – which does independent testing of antivirus solutions. Below: Average result of multiple tests between August 2009 to February 2010. 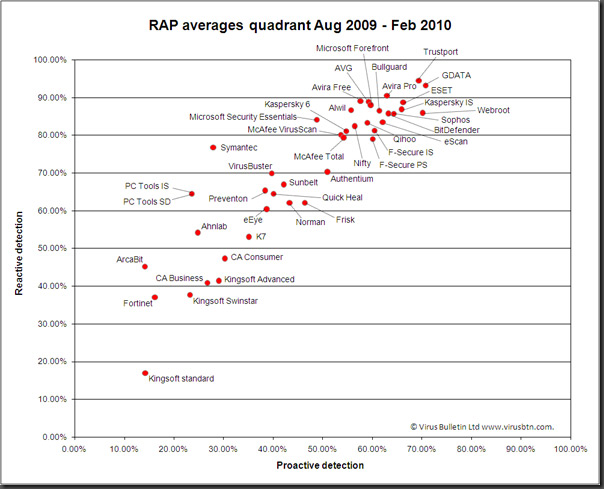 How to interpret this chart: Higher reactive AND proactive detection is good. 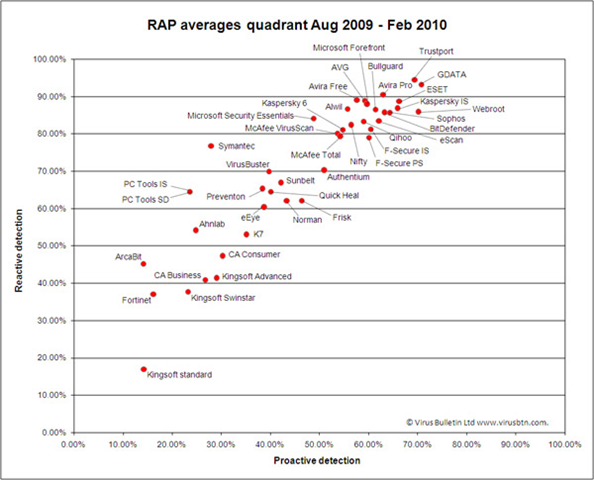 MS Forefront Client Security/Endpoint Protection is place HIGHER than Symantec and McAfee, among other competitors. Trend Micro does not seem to be included in the latest study, but it failed 3 previous tests and didn’t make it in the chart. VirusBulletin, which conducts independent benchmarking of antivirus & antispam products has rated Microsoft Forefront Protection for Exchange highly. 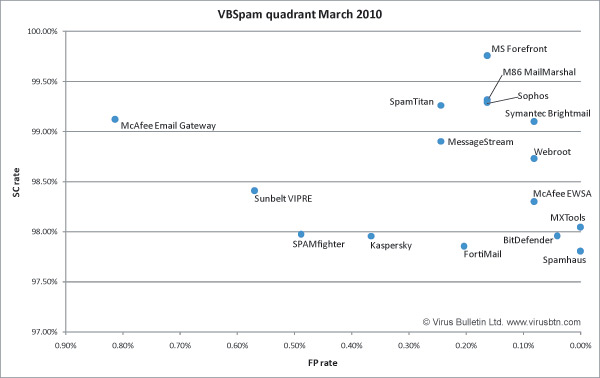 MS Forefront for Exchange won the VBspam award consistently. For more information register at virusbtn.com and view the reports. How to interpret the chart: HIGH SPAM CATCH rate (SC) and LOW FALSE POSITIVE (FP) rate is good. 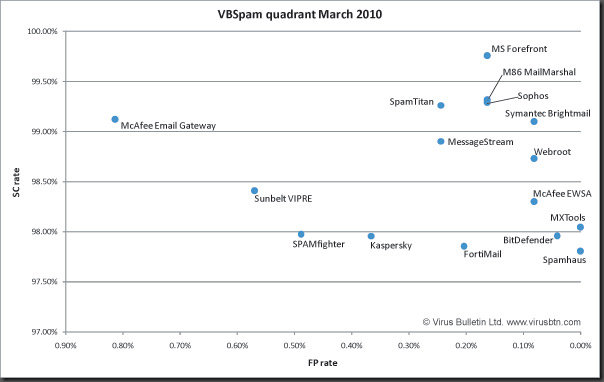 The latest March 2010 report (below) shows the MS forefront has the HIGHEST SPAM CATCH RATE (SC), while at the same time maintaining relatively LOWER FALSE POSITIVE (FP) compared Symantec, McAfee, McAfee and other popular anti spam solutions. It is worth noting that what goes into Forefront Protection for SharePoint and Forefront Protection for OCS is the same set of antivirus engines that goes into Forefront Protection for Exchange.